Sponge filtration is an often overlooked type of aquatic filter device for freshwater tanks, ponds and bowls, and even marine aquariums. Many persons look past their simplicity as ineffective, but therein lies their quality. 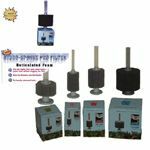 For stand alone filters, please see our Sponge Filter Kit Page with more exact aquarium sizes for stand alone filters. AQUARIUM PRE-FILTERS: See this page for Sponge Pre filters for your canister, wet/dry, or power filters. Great for live bearer aquariums, baby aquariums, etc. (including replacement sponges). The Filter Max Pre-Filter is a MUST have for use with the Rena Smart HOB Filters & the reason the Rena Smart Filter should never be purchased from Amazon!! Hydro Pond Filters are also excellent for use in high flow aquarium sumps or similar.